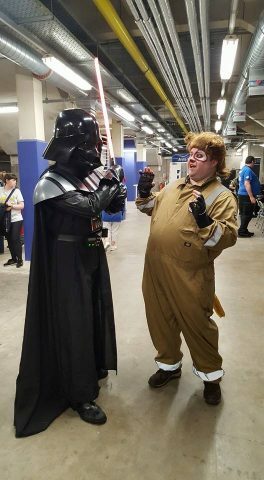 Spaceballs Costume with a Pipe Insulation Tail « Adafruit Industries – Makers, hackers, artists, designers and engineers! I bought length of pipe insulation (it’s basically a pool noodle with a cut down one side, but 1/5th of the price, you’ll get it from a hardware shop). I then took a wire coat hanger and stretched it out, then taped to the inside of the foam tube. I trimmed one end to make it more pointy and taped it in place. Then I wrapped the whole thing in fur. I basically bought a big piece of fur and cut a strip off to wrap around. Had a seamstress stitch it down one side (inside out) to make a big fur sock and then fed the foam tube into it. I was then going to feed the excess coat hanger through a belt and feed the tail through a hole in the boiler suit. however I got the seamstress to make the hole in the boiler suit (to avoid any tearing) and then sew the tail in place. She forgot to trim the excess fur off first so it was far too big, so I fed some back into the boiler suit and pinned in place. This worked brilliantly as it made the tail hang in the air and bounce, rather than droop.